Keira left a quality comment on a blog post. 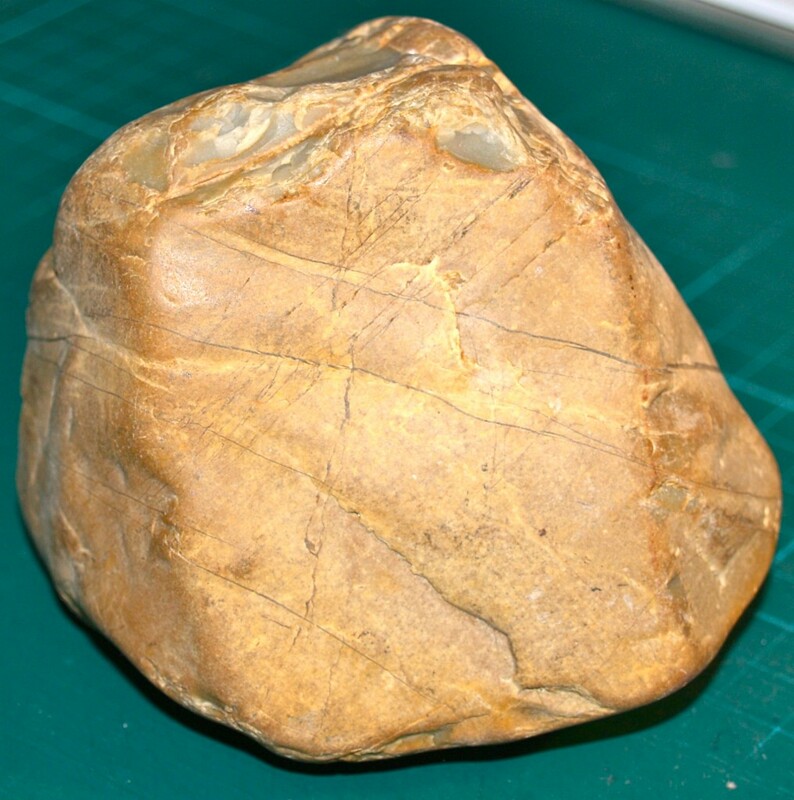 Your rock has certainly caused much thought as we have tried to uncover its secrets. Science can be like that, a chance to uncover mysteries. After leaving a reply to Heather's quality comment, I found you also left a quality comment. Do I know why your rock looks amber on the outside? From the picture, I'm not able to see the amber colour on the outside. It may be just the remainder of stone or dirt once surrounding your rock. Look at these photos. 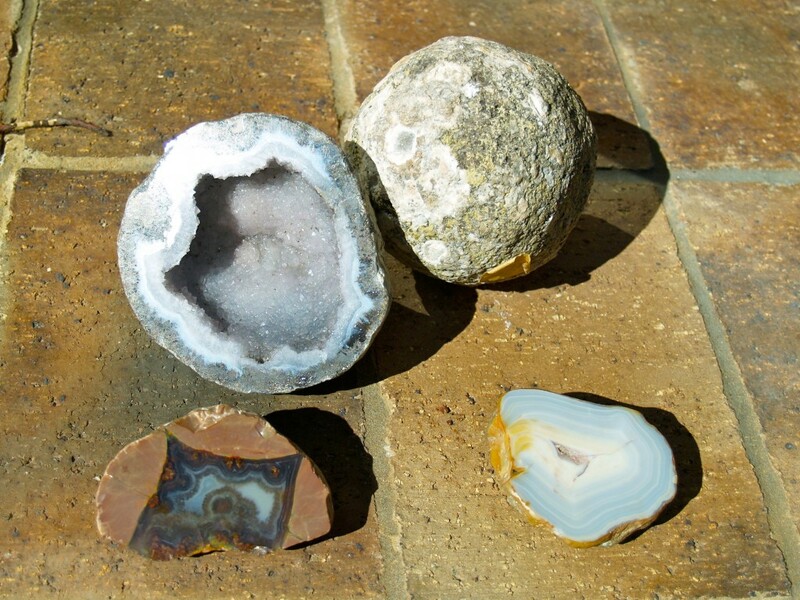 The first shows a collection of four geodes, one complete. The second shows a geode containing amethyst (mauve quartz). 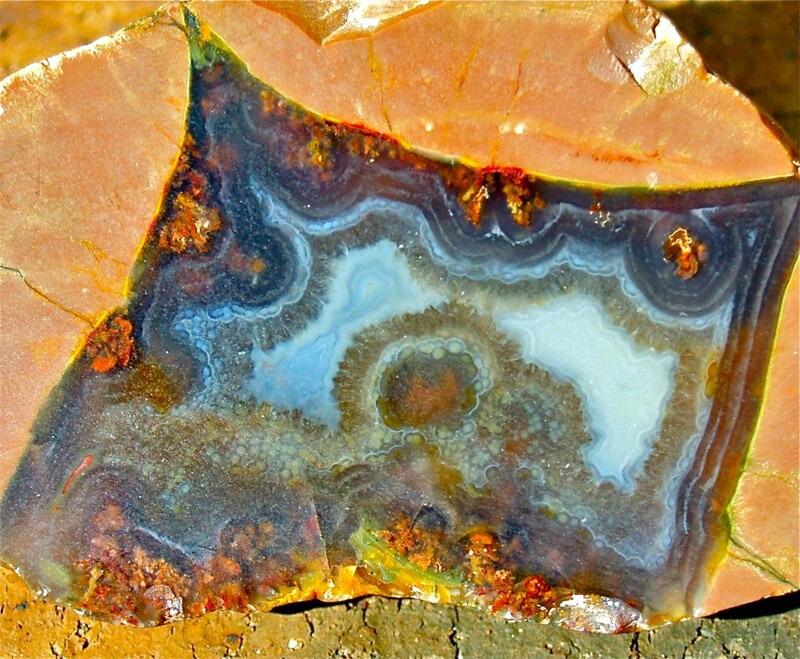 If you look closely, you can see the colours on the outside aren't always the same as the colours inside the geodes. There are other minerals probably once from the surrounding rock. Did you notice one in the top photo has a yellowish outside? It's also possible some citrine quartz crystals might have started to form on the outside. 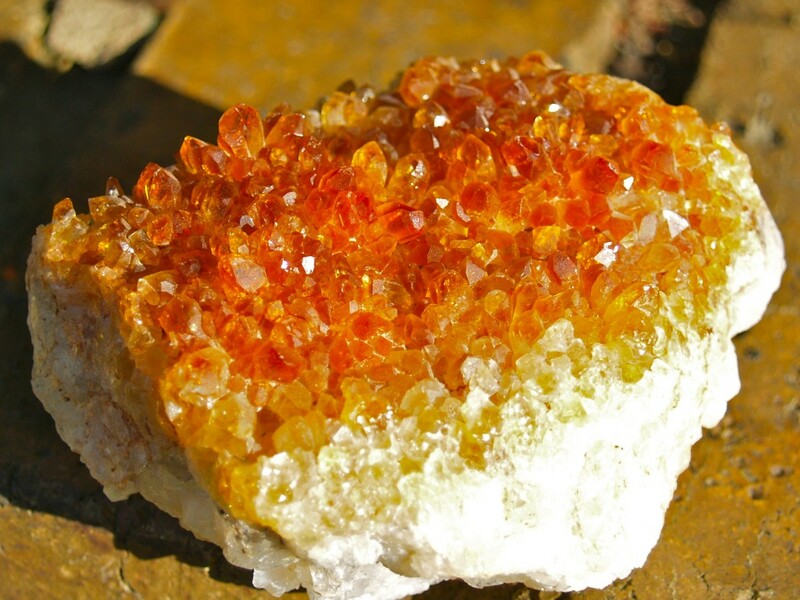 The picture below shows citrine quartz in the paler rock. We can't be certain unless your rock is checked but, no matter what is on the outside, I found your rock very interesting. I like your description of galena. It does look a little like tinfoil. Tin (Sn) is an element as is the metal in galena. 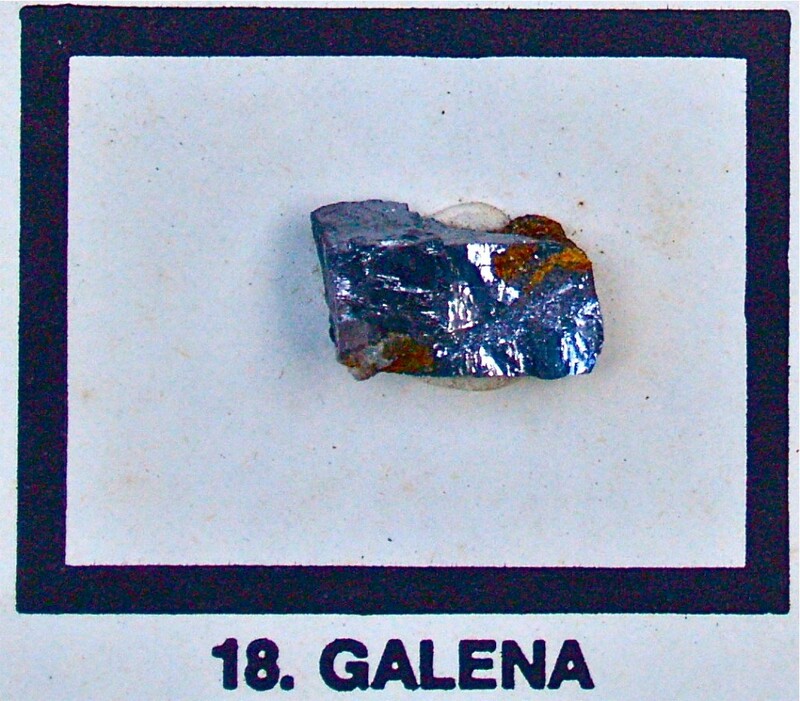 Galena is lead sulfide (PbS). It's where we get much of the lead (Pb) we use. Below is the heaviest sample in my collection. It's not the biggest in size but weighs 2500g (5.5lb). The gold coloured part of the sample is iron pyrite. 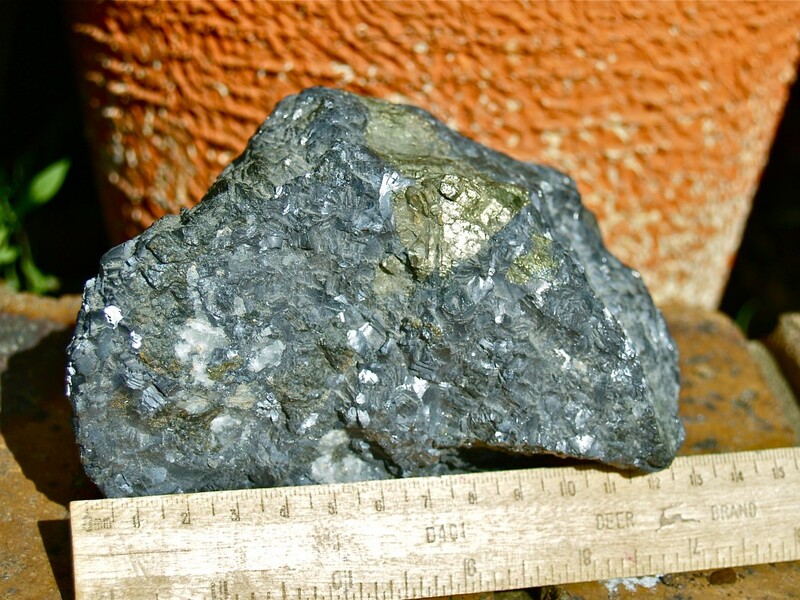 It also contains zinc (Zn) but is mostly lead (Pb) in the form of galena. The small whiter patches on the lower left are quartz. 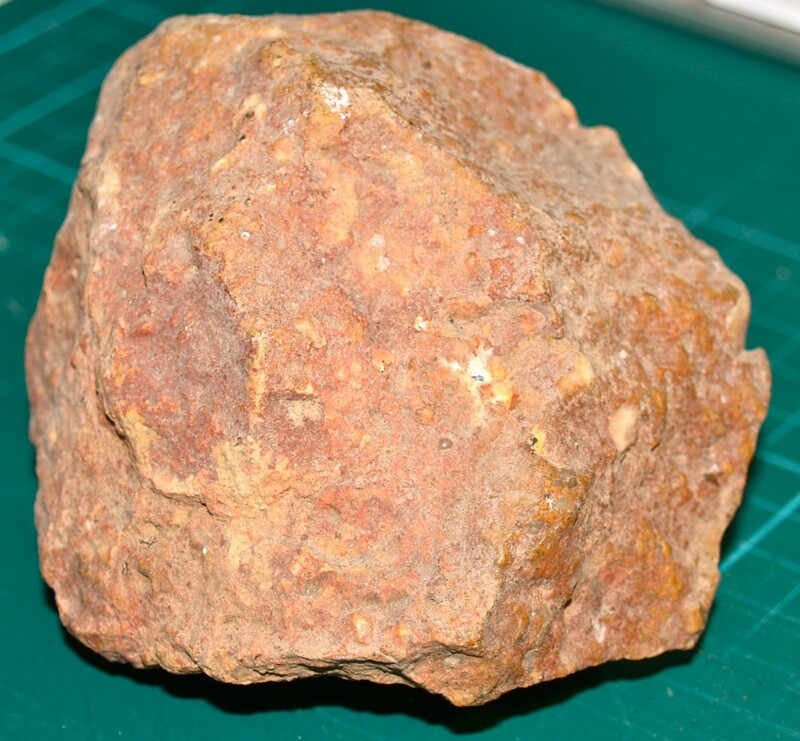 The sample comes from one of my state's major mining areas, Broken Hill. Click on GALENA and it will take you to a Wikipedia page on galena. You will see where it can be found around the world and in U.S.A..
How do you find out all these facts? I have been interested in very many subjects over the years. When I see something interesting, I sometimes remember facts and information I think might be useful in an extended comment. As I write, I start looking for more information and learn as I go. For geology, I have assorted books and I can also search online. I always try to check the information I share on blogs because I'm not an expert in any area. Like you, I'm a learner. I've just had more time to learn. Where did you get all these rocks? The first sample caught my attention because I could see crystals in it. Could it be a geode waiting to reveal something special inside? Perhaps I might one day break it open to find out. This one is a geode from Queensland. You can see the crystalline mass in it. Perhaps cut and polished, it could look very good but I like it as it was found. 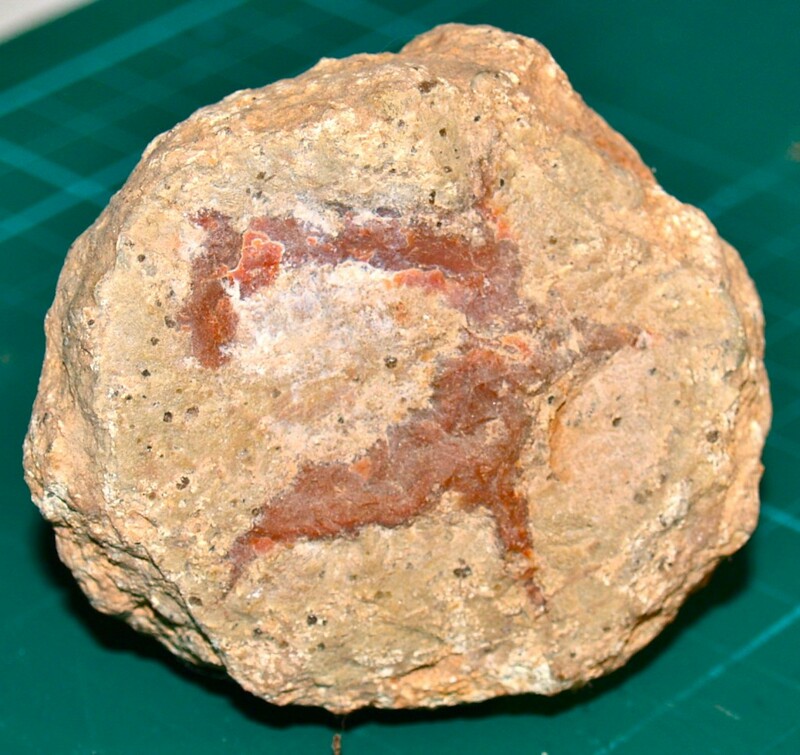 This rock was very interesting when I found it. You can see it also has a yellowish exterior like your rock but some chips broken off the rock have revealed what could be agate. I suspect this sample could look very impressive if cut and polished. The material inside might look like your rock. As I don't have access to a diamond saw to cut it, I keep it as it is, a mystery. 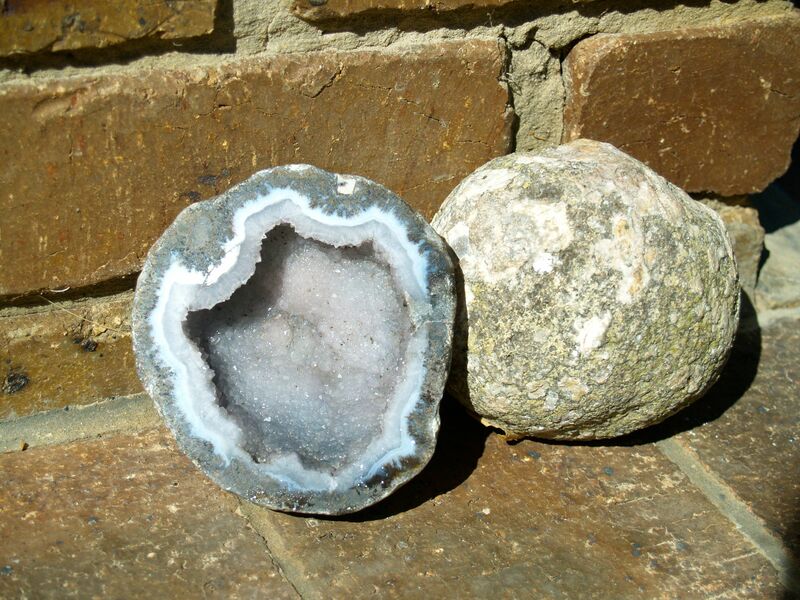 "...Geodes, the first one looks interesting to me. The middle almost looks like it is hand painted. Was the middle polished or was it like that when you discovered it?" I must say this sample looks as though it's the work of an artist. What I believe has happened is, as different minerals have mixed as the crystals formed in a space, different colours were formed. In this geode, crystal growth has filled the space. I saw this cut and polished sample in a rock shop. It was the pattern you noticed that caught my attention. In the middle of the rock that is cut open it looks like there is a little nook. Am I right? You are a very observant person. 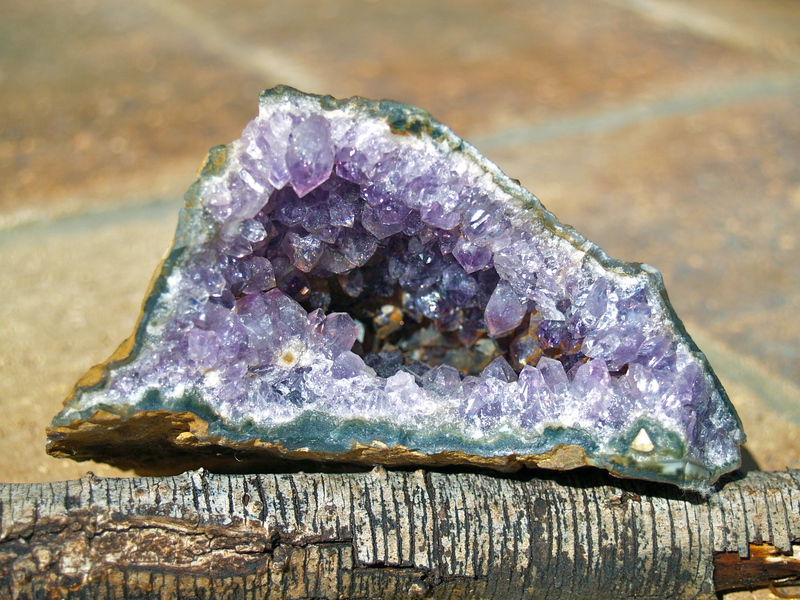 There does seem to be a little nook in the cut rock but it is due to the way the crystals have grown inside the geode. Along the inner cut edge, you can see the crystals aren't even like a circle but have some areas thicker than others. This unevenness means some areas extend out over the others. Sunlight on them leaves a shadow below. In the shadowed area, the crystals look much like the small crystals in the middle. Considering your curiosity and interest in rocks, I hope you keep learning and discovering. A mind with curiosity can be a very powerful learning tool. Posted in Geology, Rocks and Minerals, Science in the Classroom and tagged amethyst, citrine quartz, crystal, galena, geode, geology, lead, lead sulfide, quartz on October 26, 2013 by rossmannell. Since the day I found the rock that you mentioned in the post at a camping site, I have treasured it. Recently, I went camping at the same exact site, and I found many more rocks that seem to have some kind of beautiful mineral inside of it. In fact, I collected a rock that is made out of all gem. I am a little disappointed that in comments, you can not post pictures with the text. If I could, I would take a picture of all the rocks I collected so you could see them for yourself. 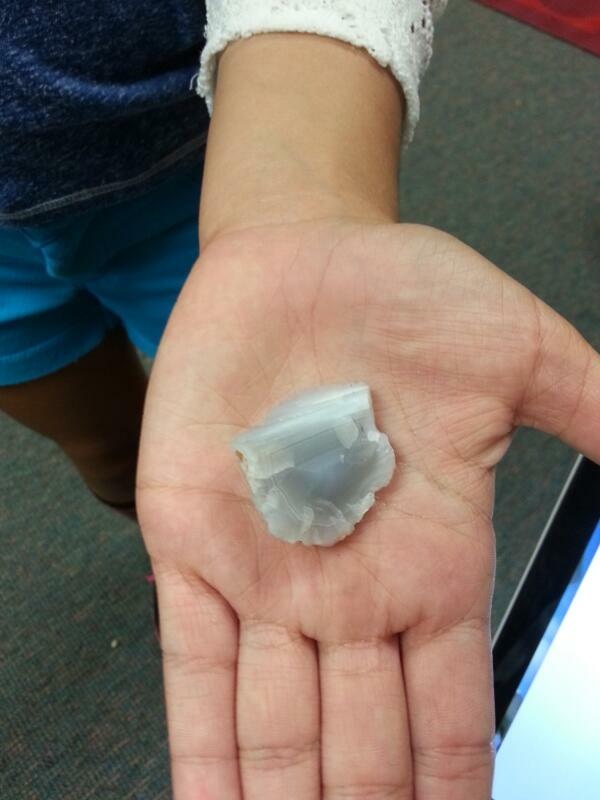 Finally, I want to ask you if you have ever cut a rock open and discovered gems inside. As you said in your post, you do not have a diamond cutter, but have you ever used one? If so, was it hard to cut the stone open? If you have never cut a stone open, would you ever like to cut one of your stones open?